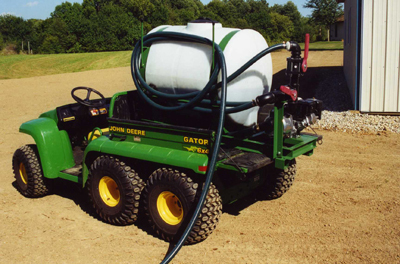 Turbo Turf makes a wide variety of hydro seeding systems ranging from small units that are great for schools, golf courses, cemeteries cities and contractors doing smaller jobs. Turbo Turf makes jet agitated units that are very affordable, easy to use and are great for landscape contractors who install or repair lawns or do new seeding. For those who want to do erosion control work Turbo Turf's paddle agitated units offer outstanding performance and the low maintenance. Turbo Turf's T series, or HARV series will play with the most difficult erosion control materials. 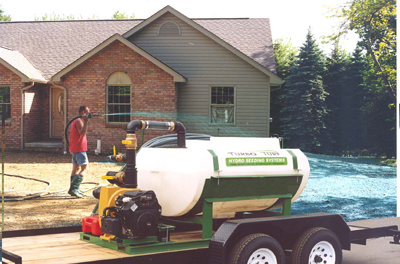 Turbo Turf's 50 gallon, 100 gallon and 150 gallon units are available either in a skid type unit or an off road pull type unit. They are great for those doing small repairs. Golf courses love them for repairing damage along a cart path, redoing a tee or bunker and other small repairs. Cemeteries like the maneuverability and the ease of hydro seeding a grave. Grass comes up much faster when hydroseeded. Schools like them for small repair jobs and construction projects. Landscapers find them great for smaller lawns, for repairing damage from construction or utility line installation and to do spot repairs. The 100 and 150 gallon units come with reliable Honda engines. They include 100 feet of hose and 3 nozzles. These units are easy to use, quick to clean up when you are done and very reliable. They feature big machine performance in a small unit. 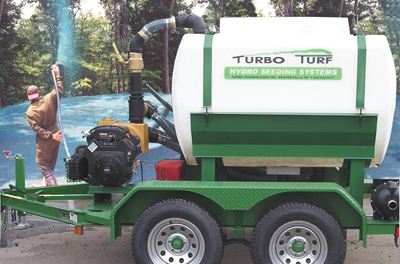 Turbo Turf's Jet Agitated units are the most reliable and easiest to use hydroseeders on the market. Learning to run one takes only minutes. They mix faster than other jet units, have great trimming ability and can seed large open areas quickly and easily. 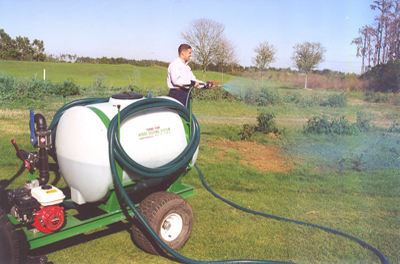 Jet agitated units are made in sizes from 50 gallons to 1600 gallons. The plastic tank makes clean up fast and easy and allows you to look back and see how much material you have left. 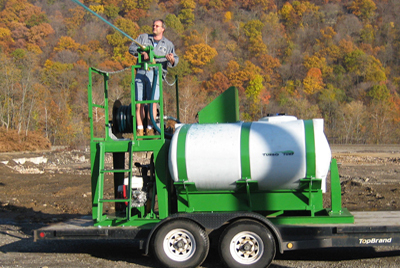 Units come with 100 feet of hose and three nozzles so you can quickly go from spraying large open areas to trimming along walks or houses or to spray for distance so you can do a tall hillside without needing to climb the hillside. 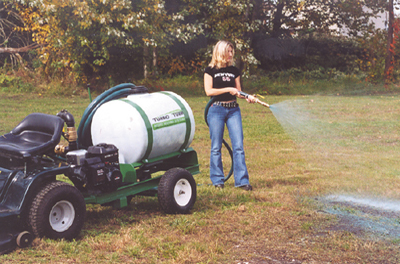 Operating a jet agitated unit is easy and a new operator can be seeding a lawn perfectly if just a few minutes. Units are available in either a skid type unit with fork slots for easy loading or in pull type units. Turbo Turf's powerful paddle agitated machines are great for those who want to load full mulch bales without breaking them up or who want to use difficult to handle erosion control materials. There are 4 models of paddle agitated units. Paddle agitated units are made in 500 gallon, 750 gallon and 1000 gallon sizes. The Hybrid series combines the best features of jet with the best features of mechanical systems. Loading mulch is easy, just remove the wrapping and drop in the full bale. Trimming is as precise as with a jet unit. With the poly tank rust is never a problem. Clean up is easy and fast. The Hyrbid will work with paper mulch or a 70-30 wood paper blend. The T series is our most affordable unit that will play with even the most difficult materials. The genuine Bowie gear pump is a positive displacement pump that allows you to use more hose than many other units. Load full bales without breaking them up. Because of the poly tank clean up is far easier than other units on the market and you never have to worry about the tank rusting. 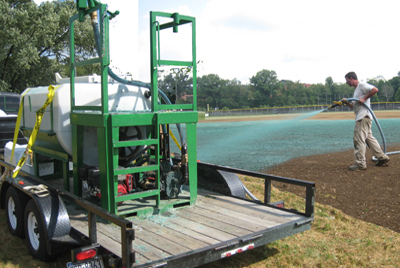 The T series will handle any hydroseeding material including paper mulch, wood paper blends, 100% wood mulches, BFM's FGM' and any other product that anyone else can use. The HARV and HARV-E feature the same genuine Bowie gear pump as the T series but with these units both the pump and paddles are hydraulically driven. This allows you to adjust the paddle speed or reverse the paddles and it also allows you to reverse the pump. Being able to reverse the paddles is great if you ever get a bale of mulch wedged between the paddles and the side of the tank. You can just reverse the paddles to dislodge the bale. Should you get a plug in your suction line you can reverse the pump to blow it out which saves lots of times compared to disassembling the suction line which will often cause you to waste a load of material. The HARV AND HARV-E have the same basic drive but the HARV includes a lot of extra featuers such as a flush tank, electric rewind reel and full sized platform with an exclusive multi-position gun.